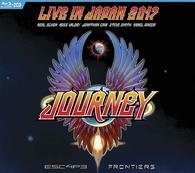 Journey return to Japan for a very special concert filmed at Budokan. This concert film captures the iconic rock band recreating their legendary albums Escape and Frontiers, in an explosive rare performance. Opening with the iconic "Don't Stop Believin'", the band rips through a 2-hour set featuring songs such as "Who's Crying Now", "Separate Ways" and "Faithfully". After the close of their performance of Frontiers, Journey returns to the stage to perform two blistering extended encores. Blu-Ray+2CD Edition. Track Listing: CD1 (Escape) 1. Don't Stop Believin' Intro 2. Don't Stop Believin' 3. Stone In Love 4. Who's Crying Now 5. Keep On Runnin' 6. Still They Ride 7. Escape 8. Lay It Down 9. Dead Or Alive 10. Neal Schon Guitar Solo 11. Mother, Father 12. Jonathan Cain Piano Solo 13. Open Arms CD2 (Frontiers) 1. Separate Ways Intro 2. Separate Ways (Worlds Apart) 3. Send Her My Love 4. Chain Reaction 5. After The Fall 6. Faithfully 7. Edge Of The Blade 8. Steve Smith Drum Solo 9. Back Talk 10. Frontiers 11. Rubicon 12. La Raza del Sol 13. Lovin', Touchin', Squeezin' BluRay contains the entire program in the CD tracklisting.